I gave up and re-named it The Saga of the New Stove. I had wanted to talk about Mom who was holding a baby in one hand, checking supper with the other while avoiding the cats and kids under her feet. But no matter how I tried I ended up talking about the stove. The cookstove pictured here was a treasure akin to winning a lottery. Before it was moved into place the only stove my mother had was a tiny tin affair - only large enough to burn kindling and hold one pot. We'd moved close to town the year I started school... although my father's idea of close and my idea of close were profoundly different. He'd built us a cabin a couple of miles from the village on the shore of a spring-fed lake. Our travels back and forth to town eventually packed down a narrow trail of sorts. An elderly woman lived by herself at the edge of the town. My mother used to drop by to visit, chop wood, maybe deliver some soup or stew. The old woman appreciated the help and let everyone know that she wanted her new young friend to have her cookstove when she died. Eventually the stove had a new owner. But there was a problem. hat cooker probably weighed 500 pounds! It took four men the better part of a day to wriggle and shove it outside the old lady's house and down two steps to the yard. And my father was expected to move it miles down a footpath that wound its way over the rugged Canadian Shield. It couldn't be taken apart and carried piece by piece because it was so rusty that it would never again be airtight if it had been dismantled. After trying and dismissing various ideas the men devised a system. They placed two sturdy logs under the stove and tied short rope handles to the ends of the logs. Straining mightly they shuffled the iron beast out of the yard, past the edge of town and onto the path. But it was a narrow footpath. It wound it's way past giant spruce trees and around massive granite boulders that hadn't moved since the last ice age. In most places there wasn't room for two people to walk abreast let alone room for a 500 pound cookstove hung up on two logs carried by four angry men. The guys decided to leave it in the bush. 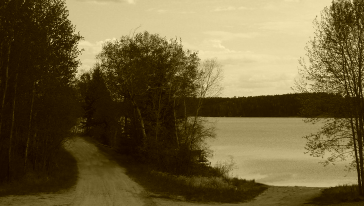 Although it took the entire town most of the summer, a wide trail was blazed through the bush that year. Every man available was put to work cutting trees then chopping the logs into firewood. Kids were coerced into carrying hundreds of loads back to their family's woodpile. Women fed the hungry hordes. Weeks later the stove arrived. It didn't fit through the door. Not to worry. The lottery winner solved the problem. She reminded her husband that he knew a lot about house building. All he had to do was take off the roof, dismantle the logs, move the stove into place and re-build the house...preferably with a sleeping loft for the kids now that the stove was going to take up so much space. So that was the saga of the new stove. And here's a picture of the path sixty years later .... somebody made it into a road! I don't know what would happen if a driver comes across someone going in the opposite direction. Looks sort of narrow! But it won't get much traffic because the land we'd been squatting on was eventually divided up and sold to folks who put up summer cabins. By the way . . if you ever meet me, ask me what happened in Chapter Two!!! Here's some more stories by Nokomis.